Sri Lanka have played in higher-octane, better contested and far more watchable series, but for pure watershed value none has left its mark on the island's cricket like this pre-World Cup thrashing in Australia. If Ranatunga had not been at the helm, things might have gone very differently; it was the kind of tour that can run teams aground. Their travails began in Perth on the second day of the series. Umpires Khizer Hayat and Peter Parker charged that a Sri Lankan hand had tampered with the seam of the ball, and Ranatunga recoiled, commencing the first of several on-field remonstrations on the tour. Then when match referee Graham Dowling convicted Sri Lanka of the offence - "giving the impression that he had made up his mind that the Sri Lankans were guilty even before the post-match hearing began," according to Wisden - Ranatunga set down his blueprint for future tussles with officials. Calling on the Sri Lankan board - then an organisation with less than US$10,000 in its accounts - to lobby the ICC, he had the conviction lifted a fortnight later. This was the theme of the tour. When Muttiah Muralitharan was no-balled for throwing in front of the biggest Test-match crowd Sri Lanka had played for, Ranatunga railed against the officials once more, and rallied his team around the young offspinner. When Australia's cricketers laid into Sri Lanka verbally, Ranatunga drove them back in his own abrasive fashion. Observers would remark that he was street-smart, in the mould of a Javed Miandad, I suppose, but this was not street smarts - it was outright aristocratic arrogance. It was just that, perhaps for the first time in international cricket, the arrogance was Sri Lankan. His team was resoundingly outperformed on the field, but came away with a new respect for themselves and their captain. It is possible Sri Lanka already had the talent to win the World Cup in Asia a few months later, but most of the Class of '96 would later reflect that they needed Australia's forge to develop their resolve. Sri Lanka's line-in-the-sand moment over Murali came in Adelaide, and it was probably the most dramatic of all Ranatunga's stands: he huffed and puffed, all righteous fury and imperious strut, until eventually he got his own way and Murali was allowed to bowl on. Emerson had been at square leg when he signalled Murali's fourth delivery a no-ball and immediately pointed to his elbow to make clear that he was calling the bowler for throwing. Ranatunga sprang into action almost as if he had been mentally prepared for just such a thing. He summoned the other umpire, Tony McQuillan over, and began a fierce discussion with Emerson, though from afar it looked more like a lecture. The photograph of Ranatunga raising his forefinger to Emerson would become one of Sri Lankan cricket's most iconic. Unable to make much headway with Emerson, Ranatunga led his team towards the boundary, but cleverly, not all the way off it, merely giving the impression that Sri Lanka were prepared to forfeit the game over Murali's no-ball, without actually doing so. 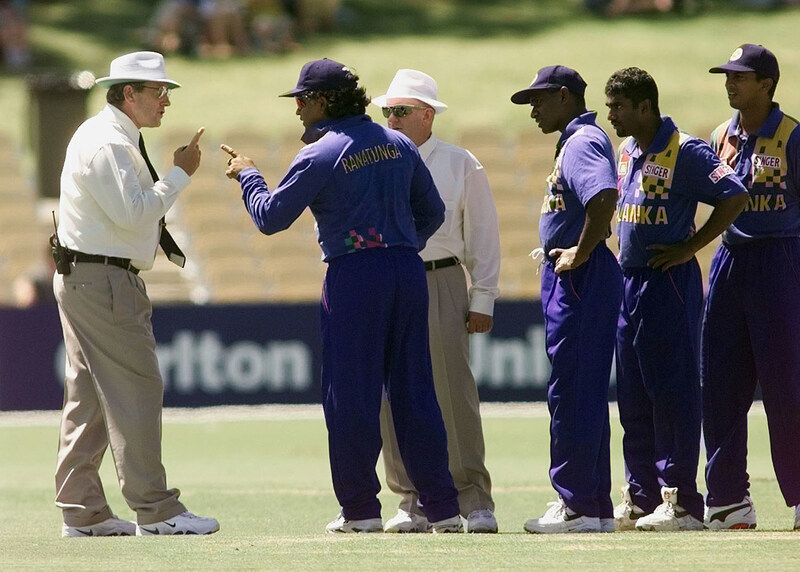 Eventually, following phone calls to board officials in Colombo and further heated discussion with the match referee, Sri Lanka took the field again, but consternation with Emerson would continue. When Murali changed to Emerson's end, Ranatunga was seen pointing to the spot he would like Emerson to stand. Neither umpire nor the Adelaide crowd took well to this instruction. Later, during Sri Lanka's tense chase, even England's players began to show their disapproval. Alec Stewart said to Ranatunga from behind the stumps: "Your behaviour today has been appalling for a country captain." Sri Lanka would go on to chase England's 302, Murali hitting the winning run. 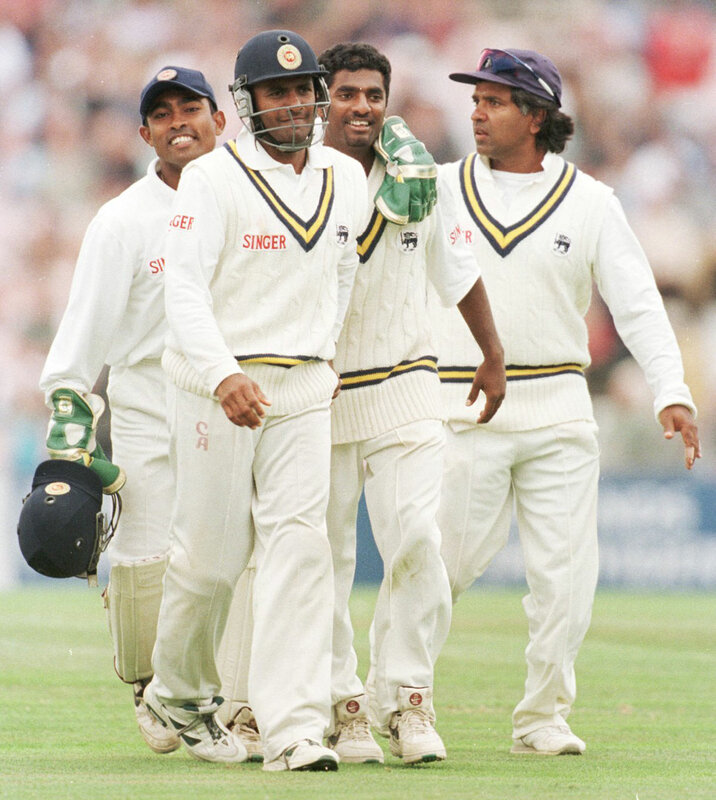 Sri Lanka were the reigning World Cup champions, so when England offered only a one-off Test in the summer of 1998, egos were bruised, and points lay waiting to be proven. Ranatunga's first move of the match was probably a false one. He put England in to bat on a flat Oval surface and watched them amass 445. But after years of Ranatunga bailing Murali out, the offspinner repaid his captain the favour: he took 16 for 220 in the match and secured Sri Lanka's first Test victory on English soil. Drawing himself to his full height and girth after the match had ended, Ranatunga delivered barbs laced with characteristic mischief, to assert Sri Lanka's new place in the cricket world. Asked at the press conference why he would choose to bowl first on such a pitch, he said: "I thought we would need to enforce the follow-on, and I didn't want my bowlers to be too tired." Inevitably, there was also a question about whether there was frustration at only being invited for a lone Test. "Well, maybe they are scared that if they give us three Tests, they will lose 3-0." Of all Ranatunga's great crusades, this was perhaps the longest running and most entertaining. The friction between them had begun on that '95-96 tour, which Warne would later remark was "the most discordant [he had] known". Yet it was ahead of the World Cup final that Ranatunga produced the first real dagger, labelling Warne an "average spinner", before going on to slap him for a six and four in the late stages of the game - the second of those shots slipping through Warne's fingers. Warne would go on to prosper against Sri Lanka, especially in Sri Lanka, where with an average of 21.45 it is fair to say he dominated. Nevertheless Ranatunga continued to wage a proxy war into the new millennium, ostensibly on behalf of Murali. The most memorable exchange between the two chubsters was, of course, to do with weight. Ranatunga had suggested upon Warne's return to international cricket in 2004 that he had got off lightly with a 12-month ban for taking a diuretic. Warne retorted: "Arjuna? He's probably slotting himself around at 150 kilos at the moment, is he? Swallowed a sheep or something?" This was practically walking into Ranatunga's comeback: "Better to swallow a sheep or a goat than what he's been swallowing." 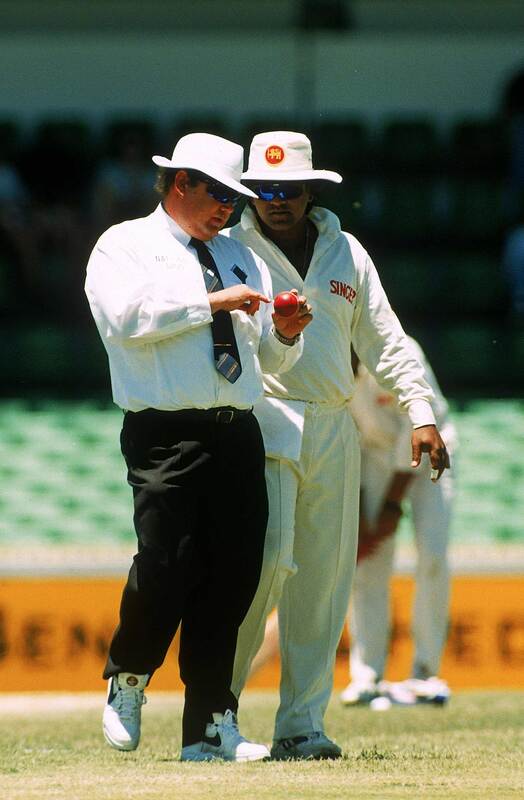 "Without any question, [Ranatunga] was the most difficult opponent I have come across… What I disliked was that he seemed to act contrary to the spirit of the game, at times pushing the rules to the limit and making life difficult for the umpires. 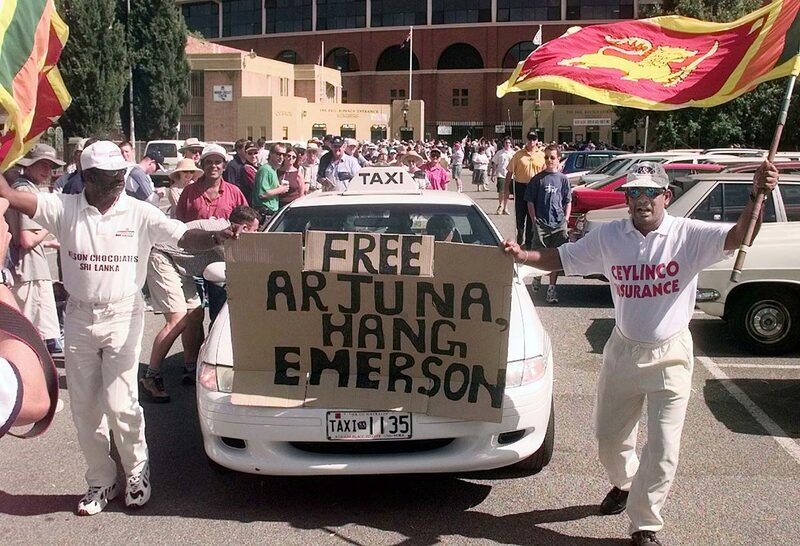 It often appeared that if there was a ruse Ranatunga could pull to try to get under our skin, he would use it." In Sri Lankan cricket you either retire from public life a hero or persist long enough to see yourself become a politician. It was the second of these fates that befell Ranatunga - though perhaps it was always his destiny. In retrospect it has even seemed like the long career as cricket's pudgy general was a larval stage for a longer career, pudgier in a different sort of white uniform. In parliament - where he has had a seat since 2001 - it is against corruption and nepotism that he has made roaring stands. On the cricket front, nothing has drawn his ire like the whamming, glamming festival of T20 north of the Palk Strait. Ranatunga nailed his colours to the mast way back in 2008, while he was chairman of SLC, labelling the IPL "instant noodles" (Warne missed the opportunity to suggest Ranatunga was the pre-eminent expert here), then blaming India's Test losses in Sri Lanka on the supposed primacy India had bestowed on T20. In the years since, he has called the IPL "a monster that will go on to destroy international cricket", "a butchery", and a "greed machine". Though Ranatunga has often been the victor in his great campaigns, ten years on, the IPL has failed to be slowed down by him. In fact, his criticism of the IPL has partly led to his sacking from SLC, as the board's relationship with the BCCI soured. Perhaps this was one crusade too far.